Now that bezel-less screens have become a trend, the next most anticipated technology is the foldable/bendable display. We all know that Samsung has been working on a foldable phone from a very long time - 2011 to be precise - and after a ton of leaks and rumours, it seems like the concept is finally going to turn out into a fully commercial device. 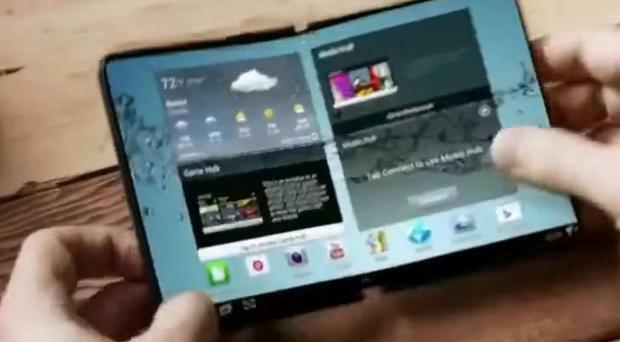 As we look back into the past, Samsung showed off a prototype of a bendable display way back in 2011. Since then, the company has been rigorously working on it and not even a single year passes by without the speculations of its release. Reports suggest that Samsung has overcome many technical issues in the development of the foldable display. The device in question goes by the Galaxy X moniker and is expected to feature a 7.3-inch display which can be folded inside. According to the patent filings and renders, the alleged Galaxy X will be tall with a vertical orientation, and the hinges will be built right into the sides of the device. The display, when kept flat open, will be rigid, but the real magic happens when we pull apart the top and bottom of the device - the hinges become visible. When folded inside, it leaves a tunnel-like space around the hinges - like the Microsoft Surface Book. But the biggest problem here is that the display should be robust and withstand several thousand folds without causing any damage to the display itself as well as internals. Furthermore, it should be resistant to moisture, chemicals, and dust like the traditional screens we use nowadays. Keeping those inevitable problems aside as they will be dealt by Samsung, let's focus on our business. Latest reports indicate that the potential release of the speculated Galaxy X might be in late 2018 or in early 2019. The hardware specifications are unknown as of now, and probably they will be changing according to the release time frame as they should be in-line with the then trending specifications. If you haven't heard this news yet then you probably missed a major announcement from Samsung. It's better to call it a secret meeting rather than an announcement as it is believed that the company had showcased the bendable display prototype at the CES 2018, but only to some high profile industry people. If this is true, then chances are sky high that we can see a teaser or at least hear about the Galaxy X at the MWC 2018. Samsung has already confirmed that it is going to unveil the Galaxy S9 line-up at the Mobile World Congress that will kick off at the end of Feb 2018. What are your opinions about the foldable displays? Let's know in the comments section below.